This performance lasted about an hour. 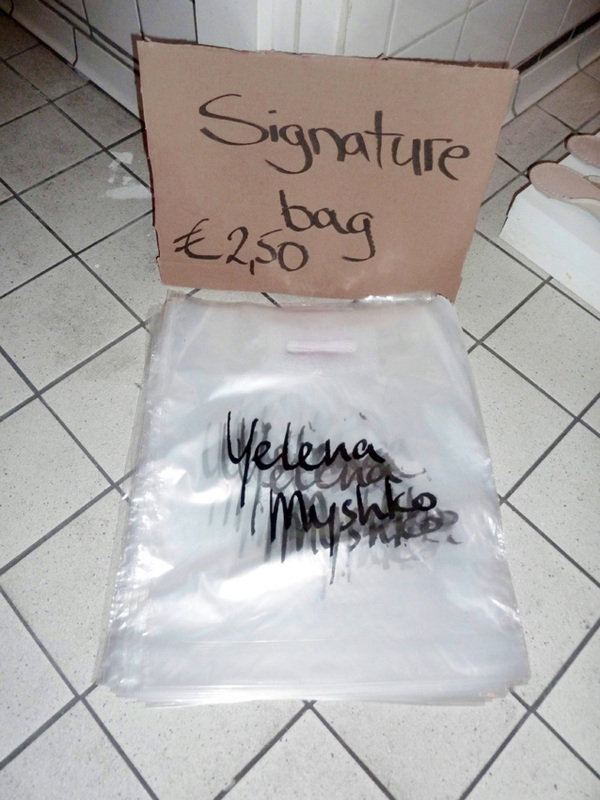 First Yelena spent 20 minutes signing plastic bags and then went around the venue selling them to the public. This gesture is a mockery of the fashion system where overprized signature bags are idolized. Although Yelena is an educated fashion designer, she does not have access to that world. Out of frustration and a twisted sense of humour she implodes her precarious situation. Having limited private funds, she chose the ready made plastic bag. Underlining that in the fashion industry goods are not made by designers, they only symbolize them. Signing the bags is a very personal gesture that creates a unique cultural artefact. Furthermore selling the bags directly to an audience makes things personal and implodes the human interaction that lacks in the fashion system between the designer and consumer. This performance is both a carricature of the fashion system and a proposition for a more personal approach.